After our women’s workshop Sunday I joined my husband, Wyndham, at our son’s house to watch the end of the Pittsburgh-Denver playoff game. I’m not gonna’ lie…as a University of Florida alumni, I’m a Tim Tebow fan. However, I’m still loyal to my New England Patriots. Sam (our son) and his wife, Leigh Ann, have a dog named Brady (yes, after Tom Brady of the New England Patriots). Brady was born outside of Denver, and Wyndham and I brought him back with us, as we returned from a conference in Denver. So, Brady and I have a special connection. Wyndham takes him (and his brother Luke who belongs to my daughter and son in law) pheasant hunting. 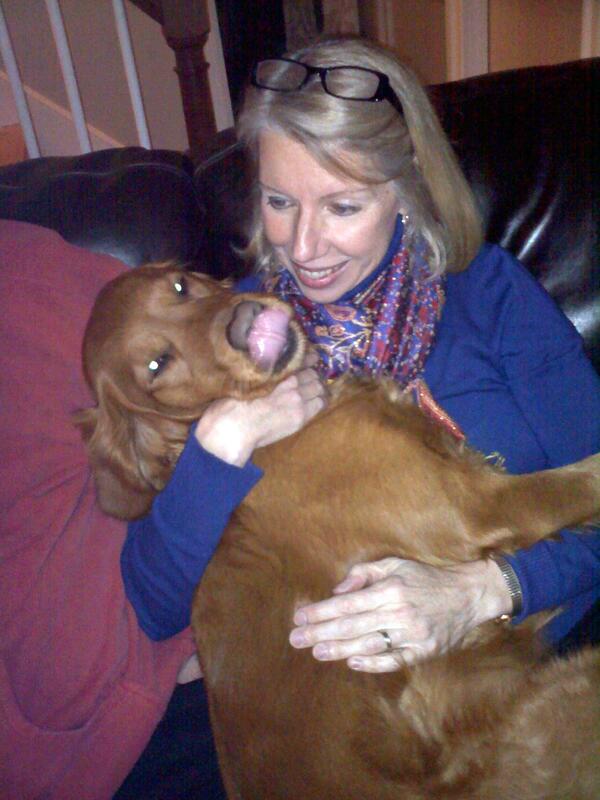 Brady does not understand that he is too big to be a lap dog, as you can see. Suffice it to say, we are attached to both Brady and Luke as granddogs. I pray that more and more people can come to understand the amazing direction and power to turn lives around… that Jesus really gives. And…well, I told Brady about Denver’s arrival this weekend. We will wait and see what happens. This entry was posted in My Morning Cup, Recent Posts, Uncategorized and tagged character, Denver, New England Patriots, puppies, Tim Tebow, Tom Brady by jeanieshaw. Bookmark the permalink. Thank you Scott. Yes, I find him an inspiring person as well.